As of late, there seems to be no sub-genre more worn out in Hollywood than that of the vampire. Thankfully, a pair of New Zealand’s finest comedic talents are here to breath new life into the blood-sucking mythology with the vampire mockumentary What We Do in the Shadows. Sporting a Real World-esque approach, we’re introduced to our main quartet, made up of Viago, the tidy 879-year-old vampire that’s the ringleader of the group (Taika Waititi, also co-director); Vladislav, a suave, once-feared 862-year-old vampire (Jemaine Clement, co-director as well); Deacon, a 183-year-old vampire with no work ethic (Jonathan Brugh); and Peter, the decrepit, 8,000 year-old (Ben Fransham). No blood-sucking myth goes un-mocked, including setting their alarm clocks for 6 p.m. to avoid death by sunlight, the problems when they dress up for a night on the town (they can’t see themselves in the mirror) and, consequently, the need to be asked into a club. While those just touch the surface of the tropes that get prodded, Clement and Waiti more importantly find inventive, hilarious ways to do so, instead of just replicating them. The thrust of the story kicks into gear when one of their victims, the twenty-something Nick (Cori Gonzalez-Macuer), turns into a vampire and joins their crew, gleaning knowledge from their centuries-long experience as blood-suckers. Naive and boastful, Nick also brings his human friend, the aloof Stu (Stuart Rutherford) into the inner circle, used primarily, but perfectly, for reaction shots to the many irregular activities our vampires partake in. Clement and Waiti aren’t afraid to insert buckets of blood (including one of the best, gory moments, when we see Viago’s first victim attack go wrong). The pair also head into dark comedic places, notably the results of a hysterical subplot featuring Rhys Darby as the alpha werewolf in an opposing gang. Although the documentary style affords some off-the-cuff moments that don’t always land, the major gags result in significant laughs. The duo also makes sure to start small and amp up the scope with each new sequence. With a slim running time and considerable chemistry, What We Do in the Shadows is proof that the vampire genre is alive and well as long as it’s in the right hands. 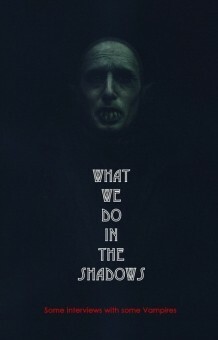 What We Do in the Shadows premiered at Sundance Film Festival 2014. One can see our full coverage of the festival below.